Mordian 7th Regiment: Necromunda - Ambots painted! Just a quick hit today - After the flurry of World Eaters and Genestealer Cult, it was time to do something small and colorful. Ambots it is! As soon as I saw the reveal for these I knew I had to get my mitts on 'em, and I'm glad to say the kit did not disappoint! They are chock full of cool little details and were an absolute blast to paint up. 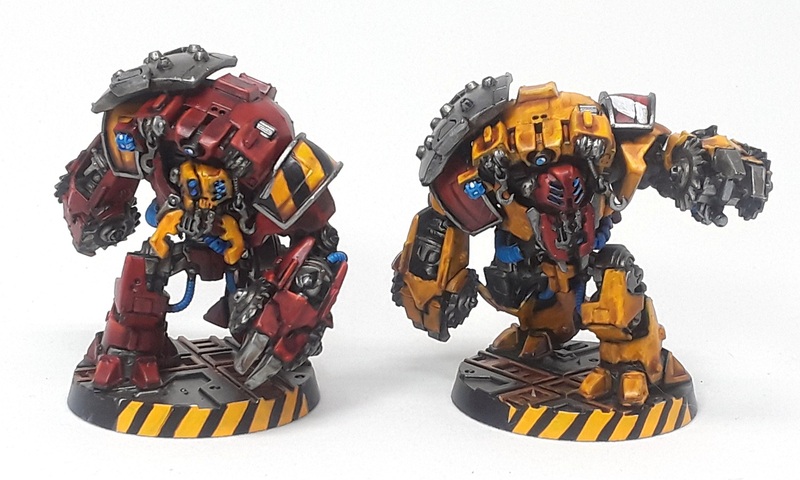 Decided to do a reversed paint scheme on the pair, one in yellow/red and one in red/yellow. Pretty jazzed with how they turned out, and am quite looking forward to doing another pair. Two is good, that means four is better, right? Indeed! I think we'll see a lot of cool conversions with these models over the next few months! Great stuff, I love the look of these, Mordian Power Cables and all! Sweet. I thought they'd make great Obliterators but now they have a new kit too! I really like the red and white hazard stripes! Sweet paint jobs! They look very cool. Those look fantastic! I really need to get my hands on a pair at some point here. They really are a great kit, will be doing a other pair m'self for certain! Oh man, love them, both schemes look great! 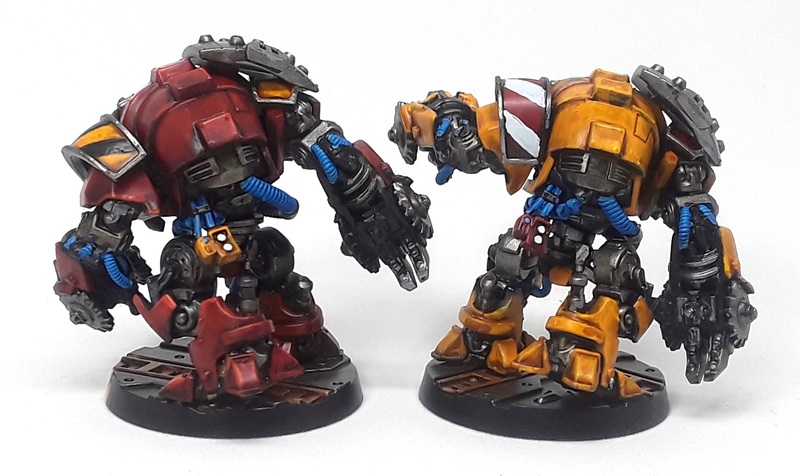 Do you happen to have any contemptor around to make a quick size comparison? I would really appreciate it. These look great. I Just finished painting one of my own! Such a fun model to paint. Awesome! Indeed, I'm definitely going to be doing a couple more in the future! Wouldn't it be nice if the kit could mix 'n' match with the Ad Mech robots ? Aye, they're in an odd size category, though they would probably look cool mixed with some of the Kataphron battle servitor bits? Hrm, now I may need to do some experimentation!